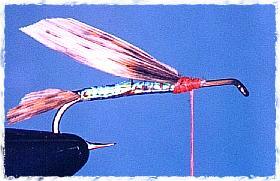 Fly Angler's OnLine "Beginning Fly Tying Part 33"
When I was a young pup, I liked to use a muddler minnow to imitate a grasshopper. Being young and foolish, I made it a practice to catch fish by dragging it through any likely hole. It was especially effective in the pockets under grassy banks where the big browns hid looking for an easy meal. As soon as I learned that my fishing method was improper and couldn't work, my success rate fell dramatically. Eventually I discovered that not all conventional wisdom was really wisdom after all, and if it worked, it was acceptable even if it wasn't considered conventional. As soon as I returned to my unconventional approach to fishing, my success rate climbed dramatically. Did I mention that I'm not always conventional in my approach to other things? One particular stream in Montana was a favorite youthful haunt of mine. It harbored some big brookies, occasionally over four pounds. As far as I'm concerned, any time you can catch a few brookies over 20 inches is a good time, and this stream usually gave up one or two on every visit. At the time, I didn't realize how special my favorite fishing spot really was. Although I occasionally used other flies, most of the time it was a muddler on the end of my leader any time after mid July. I'd let it drift and then pull it under any over-hangs I could find. It was a rare day when I didn't get a hit in every likely spot and a few unlikely spots too. Once in a while a big brown would add to the excitement, but the usual catch was brookies. Eventually others discovered my little stream flowing through that grassy valley and the biggest fish were removed by shortsighted fishermen. I suppose the reason it wasn't discovered earlier was how it looked. It had no trees, just wild rose and a few willows near the bank. It wasn't very big and the water was often a little discolored by irrigation run-off. The last time I drove past that little creek was about five years ago while I was visiting my family. The old county road that once provided access to the stream has been closed and a sign indicating a fee fishing enterprise was hanging on the gate. I suppose that's the wave of the future, but it doesn't thrill me. I often find myself wondering if a muddler twitched near an undercut bank would still fool a big brookie. I wonder if the fishing is anything close to what it once was. I'll probably never know. However, through all of this I did learn that a muddler minnow can be used successfully as a hopper imitation, and that convention isn't always the only way to approach a fishing situation. Sometimes the unconventional approach is just what the fish are looking for. 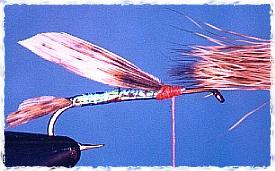 Speaking of convention, I'm usually a bit unconventional in the way I tie my muddler patterns. The original pattern calls for gold tinsel as a body material, but I usually use green mylar for the body. 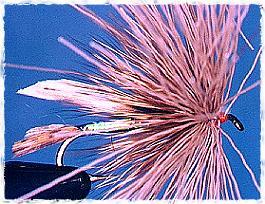 Most muddlers use an under-wing of some sort of hair. I usually don't tie an under-wing. In fact, I frequently omit the tail too. I don't think it really matters if you tie it exactly like the original, as long as it has a hair head and some sort of body that resembles the original a little. If the fish don't care, then neither do I. 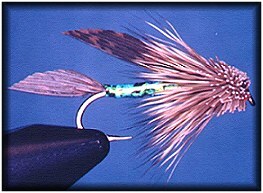 For those folks who live a long way from trout, the muddler is a great bass fly. In small sizes it's a dandy bluegill pattern too. 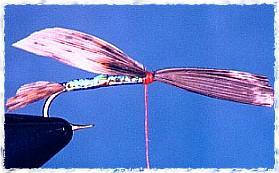 Pike, catfish, walleyes and carp can be fooled by this pattern too. Hook: 2X long streamer hook. Mustad 9672 or equivalent. Size: 1/0 to 14. Head: Deer hair, spun and clipped. 1. 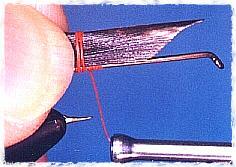 Use a bodkin to separate a small group of fibers from a turkey tail or wing feather. Depending on the hook size, these should be about 1/4 inch across. Select the fibers that exhibit the color, texture and pattern characteristics desired. I often use hair spray to keep the fibers together and minimize the tendency they have to separate. 2. When you have selected the right fibers, cut them out, trim the tips if needed and measure for length for a tail. 3. 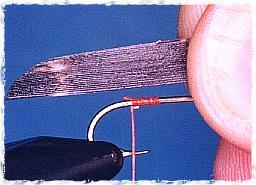 With the thread at the bend of the hook, make two very loose wraps of thread over the tail fibers, but don't cinch yet. 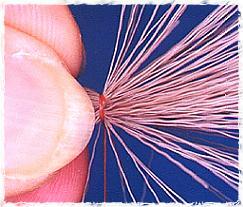 Move your fingers forward to the thread wraps and pinch the thread and tail between your index finger and thumb. Now pull the thread tight. 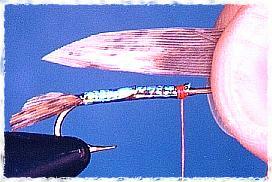 The tail fibers should bunch down on top of each other rather than spin around the hook. This method is called a pinch wrap, and is used in many applications. 4. Tie the rest of the tail fibers down with thread and trim the excess. 5. Wrap a body of mylar tinsel as shown. Tie off and trim the tinsel. 6. 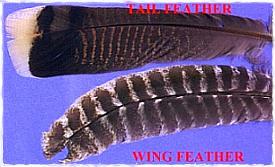 Select another cluster of feather fibers for the wing and measure for length. 7. Tie in the wing using the same pinch wrap procedure you used for the tail. 8. 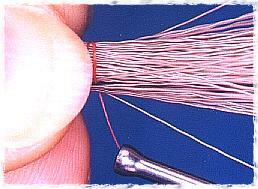 Trim the excess fibers. 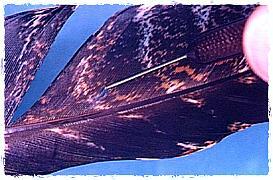 Try to get your wing to look something close to the picture. 9. Select a bunch of deer hair for the head. Remove the under-fur, align the tips in a stacker and measure for length. 10. Slip the hair down over the hook. Try to keep it even on all sides of the hook. When you have it where you want it, make two loose wraps of thread around the hair. 11. Finish spinning a hair head using the same steps you used in Al's Hopper or Dave's Hopper. 12. 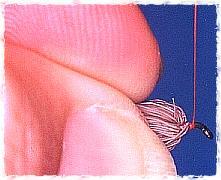 When you have finished spinning the hair, pull the hair back and make a few wraps of thread behind the hook eye. 13. Whip finish, but don't cement just yet. 14. Trim the hair to the desired shape. You can use a razor or scissors to achieve the right shape. Apply a liberal amount of cement to the finishing knot and head. 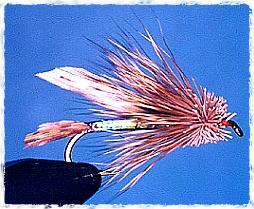 Dan Bailey was a serious fan of the muddler minnow. The one time I was fortunate enough to fish with him, it was the main fly he used. Judging by the number and variety of muddlers he carried in his fly box, I'd say he used them a lot. I guess he knew what I eventually learned. The muddler catches fish. It catches big fish, and lots of them.